Nectar Mattress Reviews: What Makes It Unique Among Others? Buying a new mattress is challenging. There are a plethora of factors to consider including how you sleep, how much space you have, and what type of mattress you want. Once you answer those questions, you still have to pick a brand and make your purchase. In this article, we’ll review the popular Nectar Mattress to help you decide if it's right for you. Currently, Nectar only offers one mattress that is available in all sizes from twin to California king. Each mattress ships to consumers compressed and rolled into a manageable cylinder. Once customers receive their shipment, they must open the mattress up and let it “inflate” before sleeping on it for the first time. Like other memory foam mattresses, Nectar features a variety of different layers inside its soft outer casing. Nectar mattresses are “medium firm” but will still cradle your body as you sleep. Also, the nectar mattress is a good fit for many people, regardless of their usual sleeping position. Occasionally, the Nectar Mattress comes with two free pillows that are made of the same memory foam that the bed features. However, we weren’t able to find any place to purchase these pillows separately. For the most part, the Nectar Mattress is just another memory foam mattress. However, as you may suspect; the complete picture goes a little deeper. Below we’ll thoroughly examine the features of this relatively new product so that you can get a clearer picture of it. Don’t forget to check out our very last section of this article for deals and coupons. If you’ve been shopping for a mattress for a while now, you know that no two brands are quite the same. While the Nectar mattress is a memory foam mattress, it also has several unique features that make it stand out from the crowd. 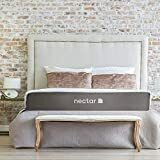 By scouring the Nectar website and looking over Nectar Mattress reviews, we’ve discovered each element that makes this bed novel. 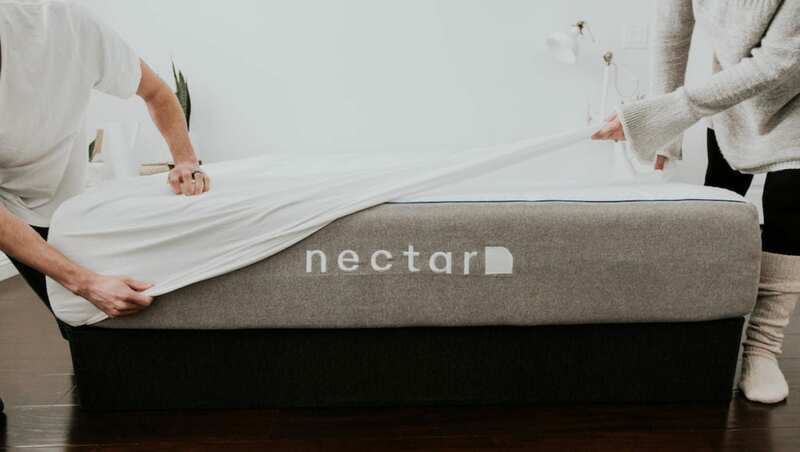 Because Nectar is a relatively new company, it comes as no surprise that they provide users with a versatile mattress. While two-sided flippable mattresses require a box spring underneath them to function correctly, the Nectar mattress does not. You can use a Nectar Mattress on any foundation or base. It is worth noting that the website indicates that its mattress will perform well on any hard surface. The company goes so far as to say that you can even place it directly on the floor. However, if you read the through the entire website, you’ll find that Nectar does not recommend keeping your mattress on the floor. As we mentioned above, the Nectar Mattress is not flippable. In fact, it features five separate layers that each provides a different function. The base layer is breathable but firm and provides support for the entire bed. The four layers on top of this initial work together to support your body and provide you with a great sleep. The outermost Tencel layer is particularly special because it circulates air around your body and also protects your mattress from bed bugs. Each of these layers creates the unique sleeping experience provided by Nectar. 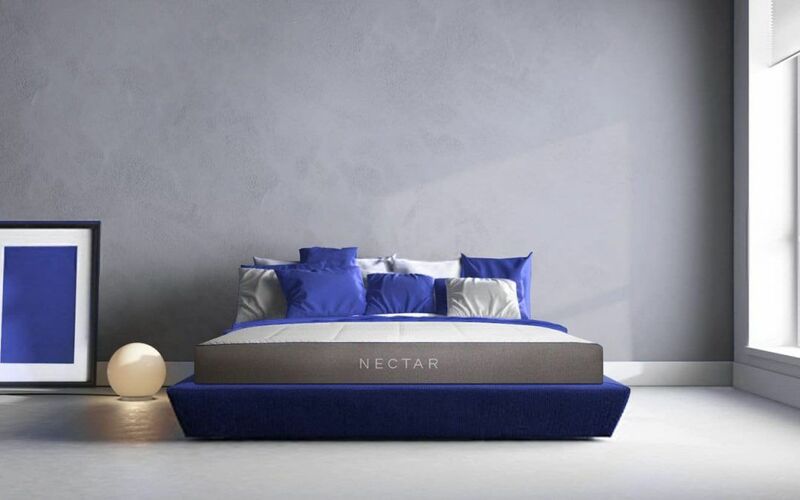 In addition to their unique mattress design, Nectar offers different accessories to improve your overall sleep experience. Of these optional additions, the most useful are the two foundations that Nectar offers. One of these foundations is a sophisticated adjustable frame while the other is an easy to use solid base. Either foundation sold through Nectar will keep your bed working well for years to come. Plus, in true Nectar fashion, both foundations ship to you directly and are easily assembled without the need for special tools. 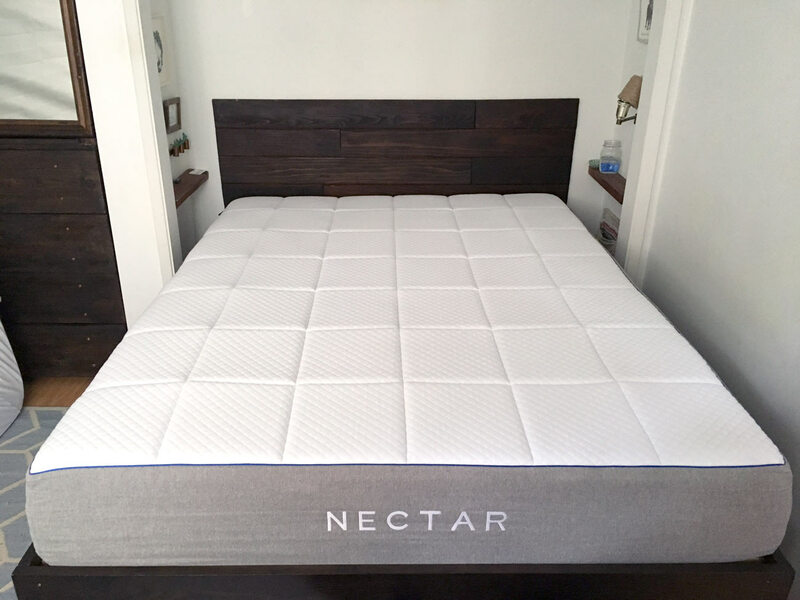 Compared to buying a mattress from a typical showroom or department store, the Nectar Mattress is incredibly affordable. According to their website, such drastic savings are possible because the company ships the mattress directly to consumers from their manufacturing facilities. Even if you buy the most sizable bed, your subtotal will be less than $$$. As we briefly mentioned above, nearly any foundation is compatible with the Nectar Mattress. That means, if you already have a box spring you won’t need to buy a new one. Additionally, if you are not concerned about potentially violating your warranty, many Nectar Mattress reviews state that this bed does well on hard surfaced floors. When it comes to shopping for a mattress, it’s hard to say what represents a good value and what doesn’t. If you are unhappy with the Nectar Mattress, it's likely that you’ll wish you had invested more money in something “nicer.” However, when it comes to bed shopping its best to drop that mentality. Because mattress designs vary widely to accommodate the wide variety of consumers, a good bed may be a bad fit for some people. The Nectar Mattress features high-quality materials that are certified CertiPur-US. The relatively low price of this mattress combined with its contents, guarantee, and lifetime warranty give this mattress an excellent value. Speaking of Nectar’s guarantee and warranty, let us take a moment to appreciate their impressive timeline. The money-back guarantee is the longest in the mattress industry, lasting an entire 365 days from the date of purchase. Nectar wants you to try their mattress out, get fully settled in, and then make a decision about keeping it. If for some reason you decide that Nectar isn’t for you, they will help you return it and provide you with a full refund. Likewise, if you choose to keep the mattress, Nectar includes a lifetime warranty that protects the construction of the mattress. Together, the guarantee and warranty add a tremendous amount of value to this product. Like nearly anything sold on the Internet today, there are several mixed reviews regarding this product. Some people swear that this mattress changed their lives. Meanwhile, other Nectar Mattress reviews declare the company is scamming people out of their hard earned money. Below we’ll discuss the different feedbacks and what might cause this dichotomy. Keep in mind, the vast majority of reviews for this mattress are positive. And indeed, Nectar reports that only 3 percent of customers return their beloved mattress. The Nectar Mattress is just one of many memory foam mattresses that are growing in popularity. People love this specific model because it offers the luxury of an expensive top-of-the-line bed with a much smaller price tag. Additionally, because it comes in a box, delivery and set up are both more relaxed than with traditional mattresses. Customers are also happy that their mattresses come with the most extended guarantee in the mattress industry and an equally impressive warranty. However, it’s worth noting that most people who buy this mattress end up sticking with it, for better or worse. In contrast to the glowing reviews that most customers leave, there are some that are less than stellar. Many customers experience challenges when trying to contact customer support services. This difficulty extends to buyers looking to return their mattress during the trial period or use their warranty later on. In addition to poor customer service, Nectar mattresses can take an uncomfortably long time to be delivered. While the company uses FedEx and touts quick delivery, growing pains have caused a bit of a backlog to distribution. Many customers report waiting longer than a month for their bed to ship only to have some issue occur while the mattress is in transit. One final complaint that is common concerns the deceptive nature of their “interest-free” financing. While the website makes it seem that funding is an easy way to spread the cost of the mattress over six months, in reality, you’ll end up paying a hefty fee for this so-called convenience. When it comes to the mattress itself, the only common complaints concern the firmness of the bed and how strong the edges are. In general, some users think this bed is too firm, and others find it too soft. Also, some users report that the sides collapse too quickly. But, in general, these complaints are few and far between. Now that you know about the ins and outs of the Nectar Mattress, we’ll explore how this bed compares to others on the market today. Below we’ll cover a comparison of price, build quality, warranty, and guarantee. Compared to traditional mattress manufacturers, Nectar’s business model deviates significantly. While mattress shoppers of the past would have to visit a specialty mattress store to pick out and buy a new bed, Nectar customers need not even leave their home. The entire process of purchasing a Nectar Mattress is handled online. Because there are significantly fewer middlemen involved in the sale and delivery of a Nectar Mattress, the average price is much lower. As we mentioned above, even the largest of Nectar’s beds are listed at under $1000. Additionally, because this mattress can be used on virtually any base, customers have even more opportunity to save. We know that Nectar mattresses are cheaper, but does that mean they are low quality? In America, we’ve become used to the idea that quality is directly correlated with cost. 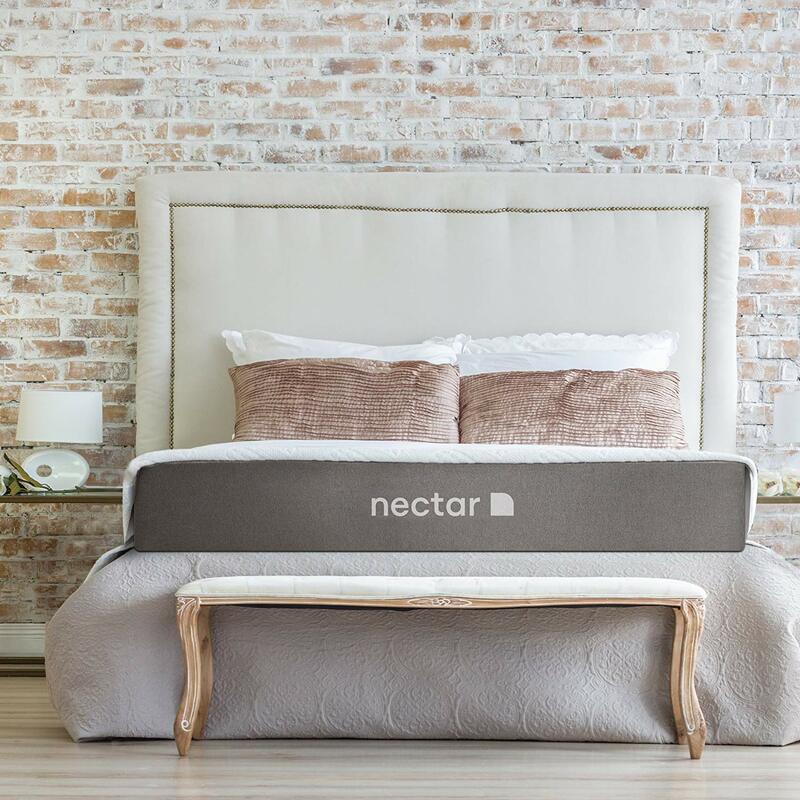 However, Nectar uses top-of-the-line materials in each of its mattresses and genuinely strives to provide its customers with a high-quality product. In general, memory foam mattresses are all constructed out of several different layers. When compared in this way, it’s easy to see that the build construction does not differ much. However, Nectar does feature more distinct layers than several other memory foam mattresses. Most mattresses come with a ten-year warranty. Nectar’s lifetime warranty seems to put other warranties to shame. Unfortunately, many customers experience at least some difficulty when trying to use their warranty. It is essential to understand what limitations the warranty has before buying the mattress. One of Nectar’s most popular selling points is its 365-day guarantee. At face value, this guarantee is much longer than most other mattress companies. For example, several additional similar “box bed” brands offer a 100-night warranty. However, it is unclear whether or not this home trial begins when you order the mattress or when it arrives at your home. Taking into consideration the current backlog on mattress orders, the trial period may not be as long as you think. It is essential that should you buy this mattress you clearly understand the terms and conditions of the guarantee and warranty. At first glance, the Nectar mattress seems too reasonable to be true. And some customers are put off by this company’s brazen confidence in their primary product. However, upon close review, it is clear that the Nectar Mattress represents an excellent value for its cost. Overall, this mattress is excellent for people who like the feel of memory foam and are familiar with its unique challenges and limitations. We love that the company stands behind their product and we adore that this product helps many people get a good night sleep.